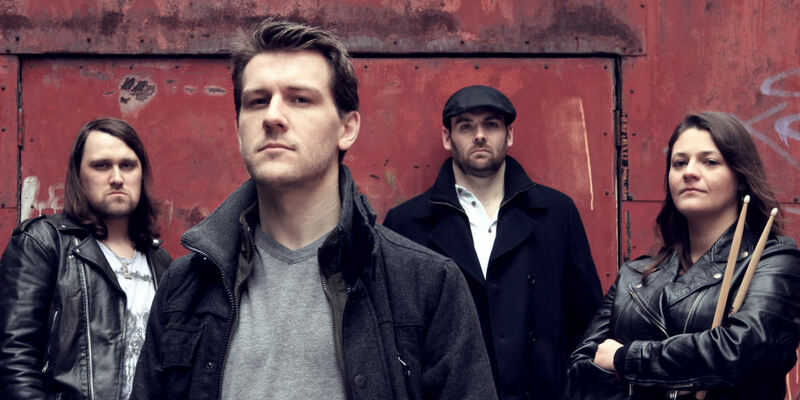 Contemporary UK blues-rock band, Albany Down, came together with some classic rock and Brit blues-rock influences, but with their 2011 debut album, ‘South of the City’, they found their own sound. Albany Down are Paul Muir on vocals, guitarist Paul Turley, drummer Donna Peters and bassist Billy Dedman and they have recorded a brace of albums with producer Greg Haver (Manic Street Preachers, INME, Super Furry Animals). Blues Rock Review offered a fair assessment of both the band and their debut album: “South of the City” is a solid debut album from Albany Down and they will be an interesting band to watch develop in the coming years”. They now step up to the plate with12 original well-crafted songs on their formidable new album “Not Over Yet”. Traditionally a band’s second album is regarded as being problematical but Albany Down have turned that notion on its head, taking all that was good on “South of the City”, honing their song writing craft and revelling in Greg Haver’s powerful production. The band’s big Zeppelin-influenced sound draws from the same British blues-rock well, that gave Zeppelin a head start all those years ago and later was rediscovered by Joe Bonamassa. But it’s the resonant substance of the band’s own songs and their exuberant style that gives the new album its edge. The debut album, “South Of The City”, clearly showcased what the band were capable of – ranging from the superbly arranged ‘Mercy’ to the low-down dirty, slide-led blues epic of the title track. “Not Over Yet” finds Albany Down playing to their strengths as they explore the full scope of their musical dynamics to match their fast rising song craft. And where vocalist Paul Muir could previously have been compared to the likes of Paul Rodgers, he stamps his own personality on this album, while guitarist Paul Turley adds his own passionate performance as part of a sparkling mix. It’s one thing to focus on your style and develop your sound, but quite another to deliver songs that can set you apart from your contemporaries. “Not Over Yet” does the trick, from the soaring Eastern vibe of the intro and the Black Country Communion feel of ‘Back Again’, to the funky bluster and potent hook of “Take This Town”. Their jewel in the crown is the mandolin-led “Man Like Me”. That’s not to overlook the climactic blues-rock ballad “You Ain’t Coming Home” and the reprise of the album’s opening Eastern theme on the big production “She’s The Light”. “Not Over Yet” also reflects the band’s old school, daily existence as a hard working road tested outfit, who have enjoyed well received appearances at the Burnley and Maryport International Rock/Blues Festivals as well as the legendary 100 Club. Albany Down are a band that runs on pure adrenalin, unrelenting energy and raw emotion. “Not Over Yet” is a landmark album full of their strongest songs, lingering melodies and great playing. They save their best for last on the epic “The Working Man”, a song for our times. The band’s stellar performance showcases vocalist Muir’s full range, and features a defining guitar solo from Paul Turley. You can pay this track no better compliment than to say it sits effortlessly with any major song from the classic rock era, and would surely light up contemporary rock radio. “Not Over Yet” is an aptly titled album and an accurate barometer of a band on the up-escalator and will soon be tearing up a venue near you.